Simplicity and simple food are power words for me this year. I decided awhile ago that I want to start experimenting food and also start cooking more. It's my one goal for the latter part of 2016. I'll aim for simple things. Simple recipes with great ingredients. Lots of herbs and lots of natural flavours. 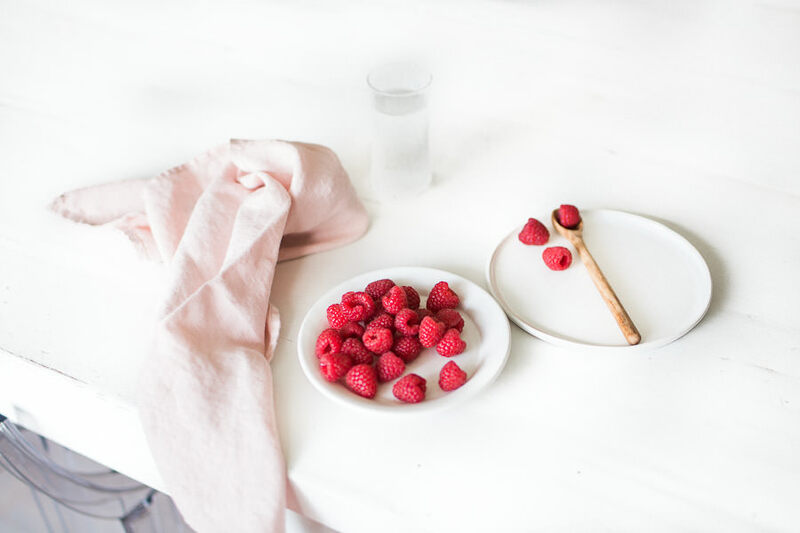 I did a quick shoot couple of days ago with raspberries and my new white ceramics that I bought from Monday to Sunday shop. Ceramics are really timeless pieces. I have been collecting them from different brands and handcrafters for sometime already. It's fun to mix and max them and not be too serious about not matching plates and mugs while setting the table. White ones are my definite favourites because they can be used in so many different ways! All the ceramics that I've collected so far can be put to the oven and dishwasher. So, they are not only beautiful but practical too which means a lot to me. The imperfect form and sometimes even rough surface of ceramics inspire me. When you see imperfections, you know that it is handmade. I prefer handmade things over mass-products. It's a marvellous thing to think that someone has made something so gorgeous by his or her own hands. You can dream that those pieces are made just for you. I'm also dreaming that I could make ceramic pieces myself one day... it's a new thing that I have to add to my "creative to do -list" which is forever growing. If you want me to do a customized shoot for you or your brand/webshop/blog/website/marketing materials, ask for my price list: hello(at) nellaino.com. While photographing my minimalistic lunch which was gathered from the weekend's leftovers, I started to think about 5 simple basic food styling tips that I would like to share with you. I love creating quick and easy lunch and that is why I also like simple food styling. Making of that simple lunch setup shown in the photo above took me about 10 minutes at maximum. Some toast, goat cheese, sage pesto, prosciutto, fresh herbs and grapes. Simple and very easy! We had a ready-made berry smoothie in our fridge so that was an obvious choice to include also into my lunch. I photographed my lunch on top of our big wooden dining table and added just one prop - a wooden cutting board. I also used the board as my plate when I actually ate the toasts. I don't photograph food so much but I have some basic food styling tips that might help you when starting out. Tell a story - think about a story behind your food and the props you are using, they should not be meaningless! Have an energising start for your week!